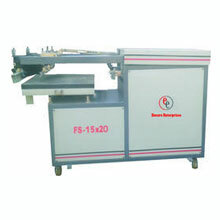 We are into Manufacturing and Exporting high quality Semi Automatic Screen Printing Machine that can print any flat objects and do the UV Spot Coating jobs of various type. Highly acknowledged for its quality, our company is engaged in offering a vast array of UV Spot Coating Machine in the domestic or local markets. We offer various sizes 9" x 11", 15"x20", 18"x24", 20"x30", 30"x40". This variety is fabricated , using premium quality factor inputs that are sourced from trustworthy vendors of the markets, in order to fulfil ever-evolving requirements of our valuable clients across markets of the country.